Significant etching effects require longer treatment times. Almost all etching gases can be used in low-pressure plasma. There are a variety of applications for plasma etching. For application-specific optimization of the etching process a variety of possible process gases and the selection of 3 basic etching methods are available. Depending on the application, this is also known as ”physical etching”, ”sputtering” or ”micro-sandblasting”. Process gases are argon or noble gases, but the ions do not form free radicals. The etching effect is based on the ejection of atoms or molecules from the substrate through the kinetic energy of the accelerated electrons in the electric field. Since ion etching does not act chemically, it works on almost any substrate (hardly selective). The etching effect of the plasma occurs almost exclusively in the acceleration direction of the ions. The effect is strongly anisotropic. Process gases are used whose molecules in plasma are mainly split into radicals. The etching effect is mainly based on the reaction of these radicals with atoms or molecules of the substrate, converting them into gaseous breakdown products. Plasma is very selective, i.e. the process gases and substrates must be very well matched. The etching is isotropic, i.e. it acts equally on all sides. Molecular gases form radicals and positively charged ions in the plasma. The reactive effect of the radicals can be used for the etching process, as well as the kinetic energy of the ions. When the plasma excitation is performed in this way, the ions are accelerated in the electric field and are fired onto the substrate. 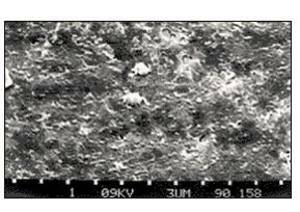 Reactive ion etching combines the effects of ion etching and plasma etching: A certain amount of anisotropy is created and materials which do not chemically react with the radicals can also be etched by this plasma. Above all, the etching rate is significantly increased. The substrate molecules are excited by the ion bombardment and are thus much more reactive. At Deiner electronic we also use plasma technology to make plastics bondable, which would otherwise be considered as ”non-bondable”due to their low surface energy. 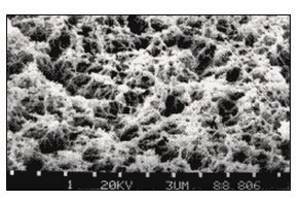 For polypropylene (PP), polyethylene (PE) or Polyoxymethylene (POM), this is achieved by activation in an oxygen plasma. For the plastic material with the lowest surface energy, PTFE, an activation process is not sufficient. The fluorine-carbon bonds can not be broken in an oxygen plasma. In hydrogen plasma, however, hydrogen radicals combine with the fluorine atoms of PTFE and so break the carbon bonds. The hydrogen fluoride gas is exhausted off, and unsaturated carbon bonds remain, to which polar liquid molecules can strongly attached. The successful etching is recognizable by a brown discolouration on the PTFE surface.